The 1700s Stepney Cemetery (a.k.a. 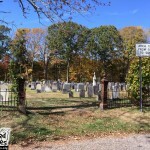 Birdsey’s Plain Cemetery or Beardsley Plain Cemetery) is haunted, according to witnesses who have seen apparitions and blobs of ectoplasm here. Some say it is the second home of the White Lady who lived in nearby Union Cemetery, or that it has its own similar ghost. Famed ghost hunter Ed Warren is buried here, near the graveyard’s southern border.